The QDC system, based on the nut-and-bolt principle, can easily be done by just one operator; It is not a hard job! Through this system, operators have more time left for other important issues in the feed mill. In addition to the increased efficiency, time and cost-saving advantages, the possibility to produce feed with different pellet sizes and special feed in the same pellet mill, the system also makes the line flexible to produce special feed just in time. 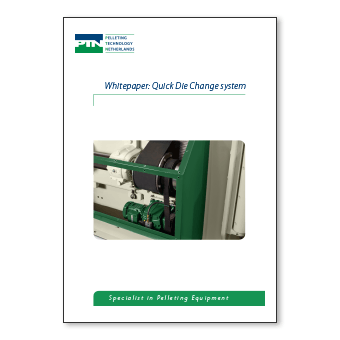 In the following whitepaper, we explain the working principle of the Quick Die Change. Die replacement time approx. 15 min.